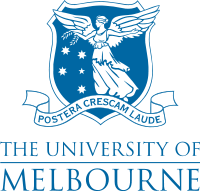 The University of Melbourne, is a public university located in Melbourne, Victoria. The second oldest university in Australia, and the oldest in Victoria, its main campus is in Parkville, an inner suburb just north of the Melbourne CBD. Other campuses across Melbourne and rural Victoria have been acquired through amalgamation with smaller colleges of advanced education. It is a member of Australia's "Group of Eight" lobby group, and the Sandstone universities. Melbourne University is ranked amongst the top universities both in Australia and the world. The University is highly regarded in the fields of the arts, humanities, and biomedicine. The University has almost 40,000 students, who are supported by nearly 6,000 staff members (full or part-time). On November 15, 2005, Vice-Chancellor Glyn Davis announced a reform programme entitled 'Growing Esteem'. The University will aim to consolidate its three core activities - Research, Learning and Knowledge transfer - in order to become one of the world's finest institutions. The University's degree structure will be changed to the 'Melbourne Model', a combination of various practices from American and European Universities, which administrators claim will make the university consistent with the Bologna Accord, ensuring its degrees have international relevance. 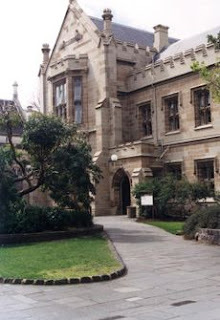 The University was established by Hugh Childers in 1853 by an Act of the Victorian Parliament passed on Saturday 22 January, and classes commenced in 1855 with three professors and sixteen students. The original University buildings were officially opened by the then Lieutenant Governor of the Colony of Victoria, Sir Charles Hotham, on 3 October 1855. The first chancellor, Redmond Barry (later Sir Redmond), held the position until his death in 1880. In the university's early days, an architectural masterplan was developed, establishing the intended prevailing building style as gothic revival. Early influential architects included Melbourne's own Joseph Reed, who was responsible for the design of many of the early campus buildings. Although the masterplan held as late as the 1930s, the 1950s saw the modernist style established as a new "house style" for the university, resulting in the mix of buildings seen today. The inauguration of the University was made possible by the wealth resulting from Victoria's gold rush, and the University was designed to be a "civilising influence" at a time of rapid settlement and commercial growth (Selleck, 2003). The University was secular, and forbidden from offering degrees in Divinity - the churches could only establish colleges along the northern perimeter. The local population largely rejected the supposed elitism of its professoriate, favouring teaching of 'useful' subjects like law, over those they deemed 'useless' in the city's context, like Classics. The townspeople won this debate, and law was introduced in 1857, and medicine and engineering in the 1860s. The admission of women in 1881 was a further victory for Victorians over the more conservative ruling council (Selleck 2003, p164–165). Subsequent years saw many tensions over the direction of the emerging University, and in 1902 it was effectively bankrupt following the discovery of a ₤24,000 fraud from the period 1886-1901 (the University's yearly grant was ₤15,000) by the University's Bursar, Frederick Dickson, who was jailed for seven years. This resulted in a Royal Commission that recommended new funding structures, and an extension of disciplinary areas into agriculture and education. By the time of World War I, governance was again a pressing concern. The Council, consisting of more businesspeople than professors, obtained real powers in 1923 at the expense of the Senate. Undergraduates could elect two members of the Council. In this period, the University tended to attract students drawn from affluent backgrounds, with a few opportunities for gifted scholarship students. The first Vice-Chancellor to be paid a salary was Raymond Priestley (1936) followed by John Medley in 1939. After World War II, demand for Commonwealth-funded student places grew in Australia, and the University followed demand by becoming much larger and more inclusive. The University celebrated its 150th anniversary in 2003. The University is the home of the Grainger Museum, celebrating the life and work of composer Percy Grainger. With more than 150 years of history behind it, The University of Melbourne is not short of notable graduates. They include: Prime Ministers of Australia, Governors-General, Attorneys-General, Governors of Victoria, Surgeons, High Court Justices, State Premiers, Nobel Laureates, a First Lady of East Timor, ministers of foreign countries, Lord Mayors, academics, architects, historians, poets, philosophers, politicians, scientists, physicists, authors, industry leaders, Defence Force generals, corporate leaders and artists.